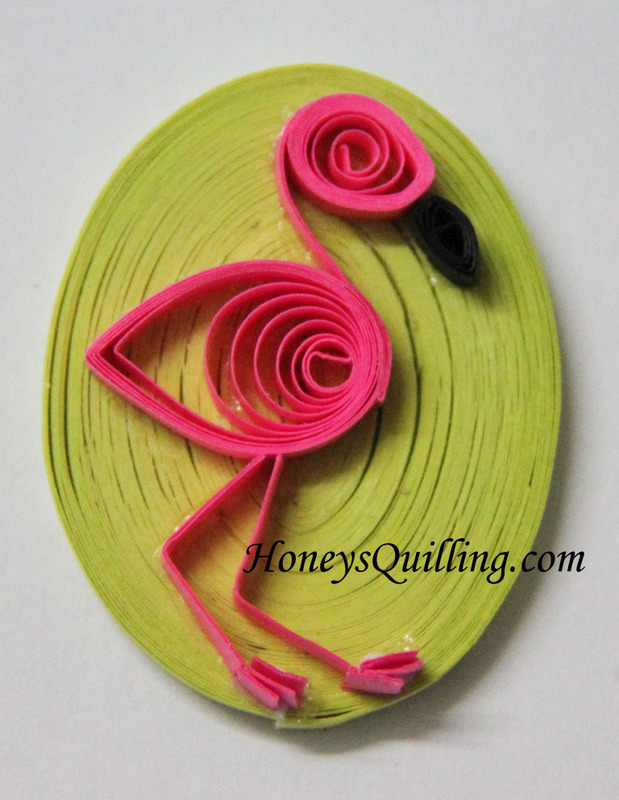 It can be a lot of fun making simple animal shapes with paper quilling. But to do so, you need to be able to think outside of the box about how to simply shapes. Look at an animal and think about it’s most basic parts. The think about how to use simple paper quilling shapes as those parts. Of course you can also just do a simple google search for “paper quilled____” and you can get some great ideas as well! Today I want to share with you a paper quilled flamingo design that I used as a magnet, and a rabbit design that I used as a pendant. Either one would work great on a magnet, pendant, frame, scrapbooking design, or anything really! Here is the flamingo. I made it several years ago as a custom order. After making each shape I dipped the side into glue and set it onto the base. You can see in the photo that the glue is glossy, if you look carefully. Now I use a matte glue as I don’t like the glossiness left over if I’m not putting a glossy topcoat on. For the legs and neck I glued 2-3 strips together so that the lines would be more bold and sturdy. I glued a strong magnet on the back so it could be used on the refrigerator. Here is my rabbit design. I made this as a pendant a few years ago when it was the Chinese Year of the Metal Rabbit. I used silver edged paper to represent the ‘metal’ of the year. After the shape was glued on and dried I used 2-3 coats of liquid sealer to make sure the pendant was sturdy. This was sold at a craft fair soon after I made it. Click here to view free tutorials! *This post contains some affiliate links and some links to my own online shop. If you purchase products through the affiliate links I get a small percentage. I only link to products that I believe in and/or love to use myself. Thank you for supporting my blog!